The exhibition Foreigners Everywhere is a group show curated by the collective artist Claire Fontaine, it reunites four artists whose works deal in different ways with the question of identity and the conflicted situation of the foreigner, the British artists, Damian Le Bas and Delaine Le Bas, the Swedish artist, Karl Holmqvist and the German artist, Stephan Dillemuth. Foreigners Everywhere attempts to question the legitimacy of cultural and geographical identities through the use of different aesthetic strategies and the building of a foreign language within visual language. Stephan Dillemuth’s work questions political economy in all its implications, including the economy of exhibition making, giving a lasting and recognizable form to the artistic gesture. He proposes for this exhibition an enigmatic sculpture that refers to an experiment on extraterrestrial communication. The blinking of a light bulb quotes the binary code of the message sent in 1974 from the Arecibo radio telescope towards the globular cluster M13 that consisted of 1679 ‘bits’ of information. The content of the message was comprised of several ‘sections’, each depicting a particular aspect of ‘our civilisation’: their visual translation is the image of the invitation card of the exhibition. The message includes numbers from 1 to 10, atomic numbers, the formulas for sugar, bases and phosphate in DNA nucleotides, the double helix structure of the human DNA, the height of a human being, the amount of human population, the schematic of the solar system and information on the Arecibo transmitting telescope. On Tuesday 21st August 2001 two new crop formations were reported near Chilbolton radio telescope in Hampshire, in the U.K.. Both were very impressive looking and consisted of a large number of small ‘pixels’, which when viewed from the air formed a recognizable shape – unlike many other crop formations. This doubtful and supernatural tale can be read, within the context of the exhibition, as a disquieting allegory of global abstract communication. 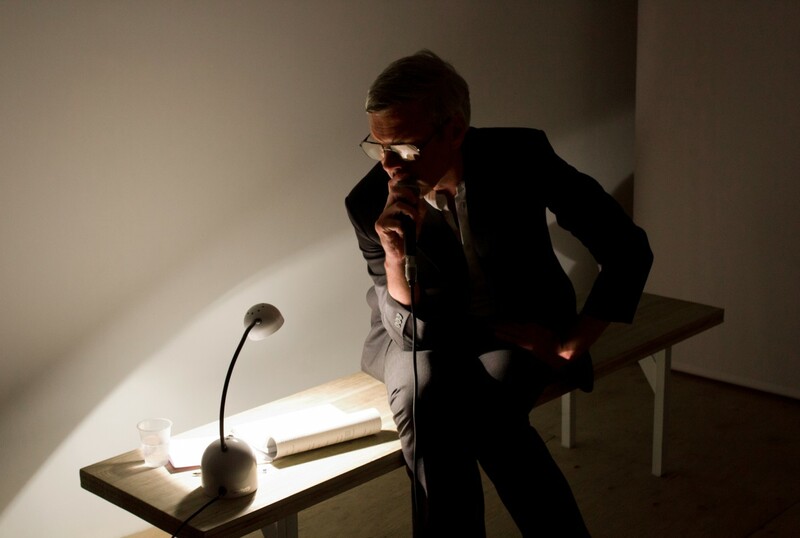 Karl Holmqvist has been working for many years with performance, video, text and sculpture. His work deals in an original and sophisticated way with the issues of political poetry and its visual presentation. 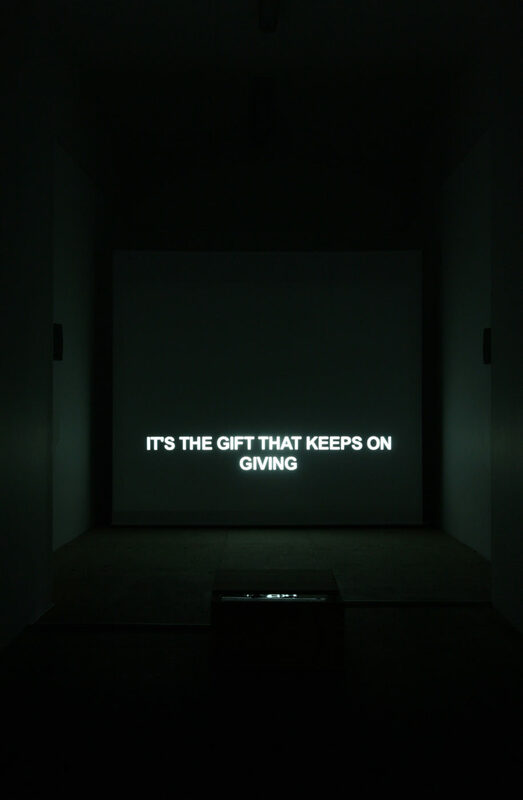 Holmqvist builds a visionary trajectory that crosses the most painful and problematic aspects of contemporary life but also touches the familiar peninsula of pop songs and advertisements. Meticulously extracting all the politically poetic moments of everyday life, the artist deals with the un-representable by using several devices, such as projections of a black surface furrowed by white subtitles displaying the words that his off voice pronounces in the soundtrack. The video presented in this exhibition is a recent work entitled ‘I’ll make the world explode’. Damian Le Bas’s work articulates an imaginary psychogeography superimposed to the objective representation of space that maps are supposed to provide. The graphic identity of territories and nations is obliterated in his works by emotional and almost expressionist paintings; the land – even in its representation – becomes the base and the support for the artwork, it’s noting but a surface to populate in the densest way possible. Delaine Le Bas has a singular practice of constructing shelters inside the exhibition space. Inspired by the forms and the materials of a spontaneous gypsy architecture, her sculpture organizes zones that recall memories of childhood and feelings from the margins of the urban and social life. She works with different medias creating a confusion of vernacular elements and sculpturally refined gestures. 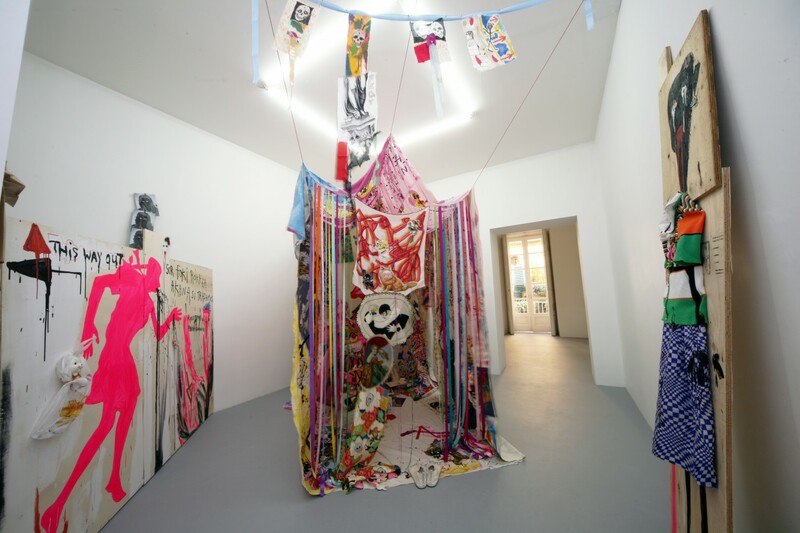 Feminist aspects are also present in her practice that evoke and deconstructs stereotypes surrounding gypsy women. Claire Fontaine, intervening here as a curator, is a collective Paris based artist currently represented by gallery T293. She works with neon, video, sculpture, painting and text, her practice can be described as an ongoing interrogation of the political impotency and the crisis of singularity that seem to define contemporary art today. 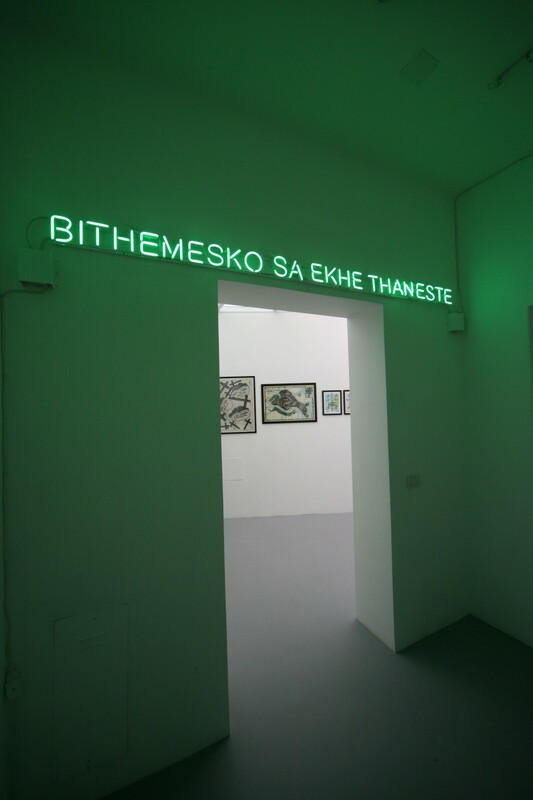 For this exhibition she presents a neon sign that reads ‘Foreigners Everywhere’ in the Romany language. 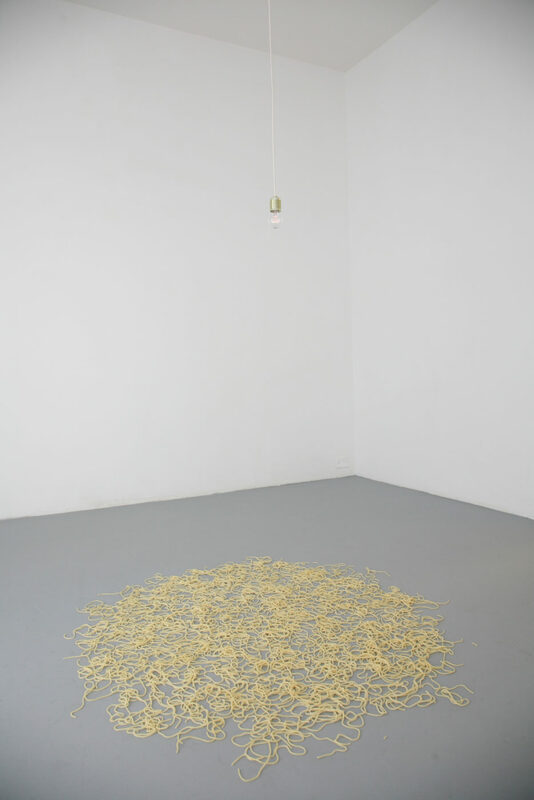 In November 2009, this exhibition was hosted in Dvir Gallery, Tel Aviv. Arecibo is on the northern coast of Puerto Rico and contains a natural disc-shaped hole in the rock. Inside this bowl was constructed the world’s largest radio-telescope, with a diameter of 1000 feet.